The 308 is a great example of Peugeot’s efforts to reposition itself as a more upmarket competitor. We like the hatch version which provides outstanding fuel consumption in the real world as well as on the official test, but does it work as a family estate? Adding weight to a car is never a good starting point as it dents fuel efficiency and handling, however thanks to the crash diet Peugeot’s engineers put the 308 through it is well placed to cope with an estate makeover. The final result is a sub 1,200 kg kerb weight which many hatchbacks would be pleased with. The biggest decision is whether to go for the extremely efficient diesel derivative or plump for this petrol unit. Unless you do a lot of miles or plan to regularly move heavy stuff, the petrol makes a compelling case; it is a chunk cheaper to buy, attracts lower company car tax, and remains very efficient. It also reduces local air quality emissions, which is an added bonus. All of this talk of efficiency and a low kerb weight may lead you to conclude that the SW has limited boot space. The good news is that with 660 litres on offer it is well equipped to cope with estate duties. Dropping the rear seats reveals 1775 litres so the occasional mattress or fridge should be covered too. 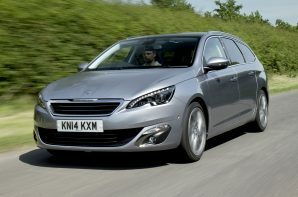 The 308 SW offers space, efficiency, decent refinement and even an enjoyable drive. As ever with modern Peugeot’s just make sure you can see the controversially positioned speedo and rev counter over the tiny steering wheel; if you can we can heartily recommend handing over your cash.